So you are ready and packed for your great adventure into some of Africa’s most pristine environments to come and explore a true African safari like no other. There will be so much to see and do during your getaway in the bush, especially when it comes to seeing the BIG FIVE that you really don’t want to have to worry about those tiny little ‘bitters’ they call mosquitoes. When traveling through Africa, malaria is quite a concern, more so in some places than others, so it is worthwhile being fully prepared and knowledgeable about what repellents and other methods of protection you can use before you start traveling. Jungle Formula (for 6 years old & up) 50% DEET. There is plenty of information on the web about malaria, what it is, symptoms and how to treat the symptoms. So we recommend that you take some time to do a little research for yourself if you know you are going to be exploring a malaria area on your travels. We would like to provide you with some useful information about mosquito repellents to guide you in your preparations. Most pharmacies or travel clinics should stock at least one of the below-mentioned repellent products, but if not you can buy them from the specific online stores that we mention below directly or from Amazon who may have better pricing and faster delivery. You will also be able to buy products in Africa but to prevent spending hours of your precious trip searching in the shops, we recommend that you buy at least one bottle before you leave. Which mosquito repellent to buy? DEET is an extremely strong repellent, so read the label closely. Reviews express that DEET is able to corrode plastic sunglasses, watch straps and discolor clothing, so do take care. Refrain from applying DEET directly to the skin in its pure form or breathing it in. Here are some internationally recommended products to consider and it has been recommended that a combination of two repellents can be used, just to be sure! Natrapel 8 Hour insect repellent: this is a CDC recommended product based on 20% Picaridin formula and is DEET FREE. It is safe to spray on your skin and clothing. For more information click here to find it on Amazon. Picaridin (20% solution): this product is said to be as effective as DEET, but more pleasant to use. Could be used together with RID. For more information visit the selection Amazon. Jungle Formula: contains 50% DEET and is often recommended by travel clinics. This is an ozone-friendly product and comes in a spray form which makes ease of application to the skin easy. This is also an appropriate product for children 6 years and up. For more information visit Amazon ‘s selection of Jungle Formula. NOTE: repellents only containing citronella oil such as candles, sprays or roll-ons are not strong enough and we recommend that you try to obtain at least one of the above products. One bottle for seven days of travel, per person. It is not recommended that you only rely on an electronic repellent, but the following product is one that can be used if would like. The Mosquito-Go Duo (Continental Europe) is a recommended option. It is a liquid-vapor mosquito repellent that needs to be plugged into an electricity socket. Visit Amazon to find out more and to buy online. Local travel stores in your country might also stock something similar. Have you ever wondered why most people of safari are all dressed in naturally toned or lightly colored clothing (or ‘khaki’ clothing as the also sometimes call it)? Yes, it is because you blend in better with the environment and the ‘cool’ colored clothing helps to keep your body temperature down during the sweltering midday heat, but interestingly mosquitoes are also less attracted to these lighter colors than dark ones. So think about packing in a lovely set of light colored cotton pants and shirt for your safari adventure! 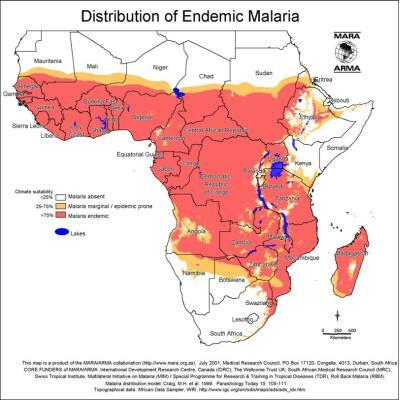 This map will give you some idea of the areas in Africa that are high-risk malaria zones. Make sure that you have long shirts and pants (trousers) to be worn most of the day, but especially in the early mornings and late afternoons (evenings) as these times of the day are when mosquitoes are most active. Use a handkerchief or bandanna spray with repellent (especially DEET repellents that should have minimal contact with skin) and place around your hat and ankles. Most safari lodges do provide mosquito nets for a buzz-free, nights sleep.